As kids grow up, there are many different activities they can take part in. Whether it’s joining a recreational sports team or taking an art class, participating in things outside of school can have a great benefit on their development. 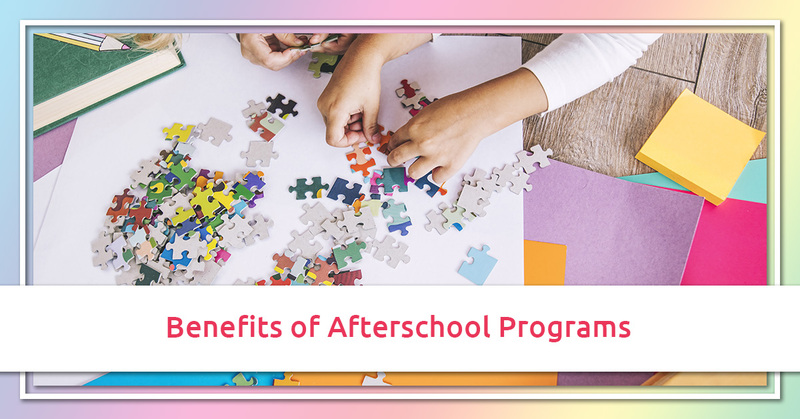 Today, we’re going to take a look at the benefits of afterschool programs and how they can improve your child’s life. If you’re looking for daycare, early childhood education, or before and after school services in the Huntington area, call Rainbow Chimes Daycare to schedule a tour today. As kids grow up, they get acclimated to meeting new kids and making friends. An afterschool program gives them a chance to meet kids that might go to a different school or are in a different grade. Since they are all together in the same program, they’ll build a sense of camaraderie stretching across age groups, which gives them a sense that they belong to something different outside of school. Afterschool programs also typically have more adult supervision, so kids will get more attention than a teacher can provide. This will make them feel more included in activities and like a part of the group, whereas school can seem isolating to some kids who may be shyer than others. One of the most important things a kid can learn is the ability to socialize with others and communicate clearly. Good afterschool programs promote cooperation, support, and respect for others and your environment. With all of those things acting as tenets of the program, kids will be more comfortable with joining in on an activity and interacting with those around them. The adult supervision will also provide a form of accountability, as they’ll be able to step in when a child is being rude or acting out, reminding them about respect, taking turns, and treating others how they want to be treated. Even extroverted kids need reminders that just because you aren’t shy, this doesn’t mean that you can act however you want. This establishes the social skills and empathy that will be so valuable to them as they get older. Most afterschool programs provide homework assistance and tutoring as a part of their services. This gives kids a chance to work on classwork without the distractions that can derail their attention at home while providing them with someone to ask questions if they get stuck on something. Not only does this establish a structured time to complete studying and homework, it will also mean that the evening will be much less stressful for kids and parents alike. Structured study sessions will also give kids the tools they need to succeed in school as they get older, as it’ll get them in the habit of prioritizing their studies. A lot of programs work to turn this homework time into something fun, so kids will be more excited to do assignments outside of school. These programs might also include extra activities like art, drama, and music to spur new interests that kids may not be exposed to in their normal curriculum. These days, it’s much tougher to have a stay-at-home parenting situation, with most families requiring two incomes to make ends meet. That means kids are often left on their own without adult supervision. When this happens, kids are much more likely to engage in risky behavior, largely because they know that nobody is watching what they do. An afterschool program is a great way to give your child the supervision they need to stay out of trouble, along with the safety of having an adult around in case something happens. Especially for little kids that are new to school, it can feel overwhelming trying to juggle things like building friendships, doing classwork, and learning new skills and knowledge. Kids who may struggle with learning or attention issues can find that afterschool programs carry lower stakes than their day-to-day school activities. This helps them relax about what’s going on and makes them more likely to take a chance and try new things. When they are able to succeed in a smaller, more casual atmosphere, they gain the confidence they’ll need to be successful in other areas of their lives. Confidence and self-esteem are two traits that are difficult for kids to build up but are invaluable to their development. As you can see, there are many ways that afterschool programs benefit both children and their parents. It takes the stress of coming home with a backpack full of assignments off everyone’s shoulders, so the evening can be filled with relaxed family bonding time. It will also help boost their confidence, improve their social skills, and provide them with a safe and nurturing environment to spend their time in. If you would like to learn more about the afterschool program at Rainbow Chimes Daycare, please give us a call today. We hope to hear from you soon!